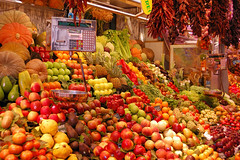 The popular Carmel market in Barcelona now has photovoltaic energy panels financed by citizens. “At the market everyone´s fighting against climate change” is an initiative of Markets of Barcelona and the Terra Foundation. The initiative´s singular characteristic is that the project counts on the participation of ordinary people. The project has been dubbed the “Ola Solar del Carmel” (Carmel Solar Wave). The concept of Ola Solar has been coined by the Terra Foundation to describe inexpensive solar installations designed to fit a sustainable capitalist model where “waves of solar citizens” may participate. The stall owners at the market have shown their interest in buying shares in the project, which run from 1,000 to 3,000 euros ($1,413 to $4,240 approx.). This isn´t a donation but rather an investment, meaning that the citizens will get a return on their investment, which is guaranteed to be at least as high as inflation. The generation center has a power of 43.7 kWh and it is expected to produce up to 5,000 kWh/year. The estimated gross return is forecast to amount to 28,000 euros ($39,575) and the pollution savings to reach 25 tonnes of CO2. The project wil make Carmel Market into one of the first public facilities to unite people in fighting against climate change through investments in renewable energies. The project goes one step further than the rest of the programs that Markets of Barcelona already carries out in the area of environmental responsability, like selective garbage collection, its posterior treatment and a commitment to install solar panels in those markets in Barcelona that are still to be refurbished. These have been busy weeks for deals in the Spanish solar energy market. We saw how WorldWater & Solar Technologies Corp., developer of high-power solar systems, announced an agreement with Prime Solar Senergy, S.L. of Spain. The latter will act as WorldWater’s marketing and logistics partner to acquire and fast-track large scale photovoltaic installations throughout Spain. WW&ST is also negotiating final contracts with a third company, M&G Promociones, to build three 10-MegaWatt (MW) farms over the next three years and two additionally planned 50MW farms in Lorca (Murcia Region). WorldWater owns the only patented technology that allows the operation of electric motors up to 1,000 horsepower on solar power alone. A second operation announced in recent weeks has been the take-over of Panergia, a leading Spanish renewable energy project management and development company, by Epuron GmbH (a subsidiary of Conergy). With this acquisition, Epuron’s project pipeline for large-scale solar power plants in Spain has expanded to a total output of some 150 megawatts. By the end of this year, Epuron will be on the road to complete and connect solar energy projects in Spain that amount to an expected total capacity of more than 20 MW to the public power grid. But the list does not stop there. Kyocera announced on September 12 it had been selected by Madrid-based Avanzalia Solar, a turnkey solar project developer, as the sole supplier of photovoltaic (“PV”) modules for a super-large-scale solar electric generating system in Salamanca, Spain. The facility, known as Planta Solar de Salamanca, incorporates about 70,000 Kyocera PV modules in three separate arrays 89-acre site. Planta Solar de Salamanca differs from most other solar electric power plants not only by scale, but also by basic design. Solar PV systems have traditionally been deployed for “distributed” power generation, in which individual homeowners or business owners install their own systems on their own rooftops or immediate grounds. In contrast, Planta Solar de Salamanca was designed as a “central” generating facility to serve a large number of remote users, following the model of more traditional commercial power plants. This design is made economically feasible by the “feed-in” tariff adopted in Spain. Next week, we are going to be visiting the Solar Power Expo in Long Beach, California, so I expect to be able to report on more bits of news from this ever changing industry. In a better spirit and more wisely than in past wrangles about fishing, Loyola Hearn, the Canadian Minister of Fisheries and Oceans and Elena Espinosa, Minister of Agriculture, Fisheries and Food in Spain, signed a MOU agreement on September 9th. The Canada-Spain MOU will advance technical, scientific, economic, and enforcement efforts related to fisheries issues, particularly in the Northwest Atlantic Ocean. This includes promoting joint participation in research projects, encouraging commercial exchanges, and facilitating initiatives that will continue to improve the conservation and management of regulated fisheries. The fishing industry is very important to both Canada and Spain. Both countries have reached the conclusion that, by establishing broader science networks, they can learn from one another and improve their marine science capacity. Thus, a strong scientific foundation will be established for proper decisions to be made at the international level, ensuring sustainable use of the resource. This MOU enhances a cooperation already visible through the Collaborative marine science initiative launched this year. The background for the project was a Spain-Canada workshop in New Brunswick last Spring (March 2007) to support the sustainable management of both nations’ fisheries and oceans. The result was an agreement to collaborate on the following fields : fisheries science, aquatic invasive species, aquatic animal health, and aquaculture and genomics. The Canada – Spain agreement provides a framework for scientific projects of mutual interest. So far, some initial research projects have been funded, on fisheries science ($25K) and aquatic invasive species ($25K).In August 2007, DFO scientists collaborated with their Spanish counterparts on a scientific survey on Greenland halibut and other species in Canadian waters. This research will increase the knowledge of straddling stocks and provide a greater joint understanding of the Grand Banks ecosystem. Regular teleconference calls between Spain and Canada keep the Marine Science Collaboration Initiative advancing and information on fisheries science and survey activities flowing. In addition, senior Canadian officials, and officials from Genome Canada, are planning to travel to Spain in October 2007 to discuss possible genomics research and other science projects with Spanish officials. Scientists in Spain believe they have found the killer parasite that is responsible for wiping out bee colonies from California to Cannes. The assassin, they believe, is Nosema ceranae, an Asian parasite which has worked its way into hives across Europe and America, wreaking terrible damage on the bees’ internal organs. This also explains the mistery of why bees seemed to simply disappear. Weakened by their inability to eat, they die far away from the beehives. 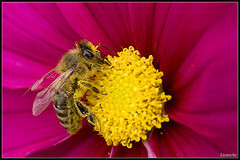 The parasite is a close cousin of Nosema apis, which has lived in relative harmony with bees in Europe and elsewhere for centuries. However, the new variety of Nosema is hardier than the old one, and so continues to thrive under harsh weather conditions. “It does not care whether it rains or whether it is more or less hot,” said researcher Mariano Higes. It also spreads easily and rapidly. The scientists at the Regional Apiculture Center in Marchamalo, near the central Spanish city of Guadalajara, said the discovery opened the way to discovering ways of controlling and eradicating the pest. Mr Higes said that a wave of what is known as colony collapse disorder, which has wiped out hives across two continents, may also be due to other factors, but that Nosema was a key cause. “We think that Nosema ceranae could do it alone,” he said. The results of the Spanish research, carried out on samples from Germany, Spain, Switzerland and France, are due to be published in the next edition of the journal Invertebrate Microbiology. The team has also been studying samples sent from the US, where colony collapse disorder has hit 35 states and affected up to 875,000 out of 2.4 million hives. The disorder, which has also wiped out bees in Canada, Brazil, India and Europe, kills up to 90% of bees in each hive. A significant collapse in the worldwide bee population could threaten food supplies as bees pollinate 90 crops around the world. Spain has an acute interest in solving this problem, as it is home to a quarter of the European Union’s bees, with 2.3 million hives. Treatment for nosema ceranae is effective and cheap — 1 euro (US$1.4) a hive twice a year — but beekeepers first have to be convinced the parasite is the problem. In Britain, the Department for Environment, Food and Rural Affairs has insisted that recent bee losses are not a sign of colony collapse disorder but the work of the varroa mite, which eats bees and their larvae. The Spaniards ruled out the varroa mite in their study, because it is easy to see and it was not spotted in most of the affected hives. Other theories point fingers at mobile phone aerials, but Higes notes bees use the angle of the sun to navigate and not electromagnetic frequencies. A third line of investigation was published recently by an American team in Science and blames a pathogen called Israeli acute paralysis virus. This problem affects nearly one quarter of the earth’s land area and about one sixth of the world’s population. The worst-hit areas are sub-Saharan Africa and Central Asia. Globally, desertification costs an estimated $65 billion a year in lost income. To discuss ways to stop it, more than 2,000 delegates from 191 countries around the world have gathered in Madrid for the eighth session of the Conference of the Parties to the United Nations Convention to Combat Desertification (UNCCD). The meeting began last Monday (September 3) in the Spanish capital and ends next Friday (September 14). It includes the presentation of a ten-year plan aimed at helping preserve the livelihoods of millions of the world’s poorest people. The gathering comes amid a flurry of international attention on the environment. The week before last, delegates from 158 nations gathered in Vienna to consider steps toward agreeing a new climate pact to replace the UN’s Kyoto Protocol. And, later this month, there will be a major gathering on climate change both at the UN in New York and one in Washington hosted by U.S. President George W. Bush. As for desertification, climate change is seen as just one of several causes of a ravaging process that quickly transforms arable soil into dry wasteland. One key cause is modern agricultural practices. Modern farming requires massive amounts of water. That depletes underground aquifers, which are often then filled by seawater. That salinized soil then requires chemical fertilizers to hold onto water. Those chemicals do their own damage to the land, further stripping its ability to absorb rainfall. Over time, the soil becomes so depleted that it becomes parched desert. And it’s happening around the world, from the Aral Sea to the Mediterranean to North America. Unless action is taken to curb the problem, the UN warns that some 50 million people could be displaced by desertification within the next decade. Experts in Madrid will be looking for ways to implement land management policies that protect existing flora from overgrazing and unsustainable irrigation practices. After all, it’s easier and much cheaper to prevent the problem than it is to fix it after once-rich land has been transformed into desert. The host country is extremely sensitive in this regard. Nearly one-third of Spain’s roughly 200,000 square miles faces a “significant risk” of desertification, making it one of Europe’s most affected nations, according to the Spanish environment ministry. Spain has proposed that the European Union set up a Center for the study of drought and desertification in the city of Barcelona, building up the capacity of an existing center to study the same problems. As part of its compromise to fight desertification, Spain has already agreed to start managing this year an alert system to forecast sandstorms in the Sahara and Maghreb area with up to five days warning. The country is also building an all-Spanish satellite that will have as one of its specific missions weather observation. It will be part of the Global Monitoring for Environment and Security European initiative. The current operating satellites in the joint endeavor are proving immensely useful in obtaining reliable and timely information about the state of our world. (See here, for example, its capabilities put to use in the aftermath of a summer forest blaze in Guadalajara. It allows for an adequate measurement of the ecological damage). As for seeing the glass half-full, maybe we can reflect on an example used by Jared Diamond in his splendid book Collapses. He explains how some societies were on the verge of ecological collapse but did recover. One such case is Japan. Japan almost destroyed its forests, but quickly realized its mistake and went on an intensive reforestation program. It also helped that Japan is a country with great respect and admiration for its natural environment. It will take bold leaders and a conscious effort from all members of our societies, though. Via Environmental Law & Policy Center: This has been a good week for supporters of renewable energies in Illinois. Gov. Rod Blagojevich, D-Ill., signed into law a renewable energy standard that will require Illinois utilities to supply 2% of their power from renewable energy sources by 2008, 10% by 2015 and 25% by 2025. An accompanying energy efficiency portfolio standard requires utilities to reduce overall electric usage by 0.2% of demand in 2008 and 2.0% by 2015. Wind power is expected to play a major role in new renewable energy generation in the state as utilities work toward meeting the new requirements, according to the governor’s office. Illinois is the hub for many transmission lines, making connecting new wind projects to the electricity grid more affordable than in other states, the governor’s office adds. There are now 5,500 MW of wind power in the development stage in Illinois, according to the engineering firm Black & Veatch. The AWEA database lists ten new projects, of which one is in construction and 9 in the proposal stage, with Horizon Wind Energy (EDP Group) and Navitas Energy (Gamesa) as the most active wind developers in the state (3 projects each). The governor of Ohio, Ted Strickland, also unveiled an energy plan last week. Its cornerstone is a requirement that 25 percent of the electricity sold in Ohio by 2025 come from either renewable or so-called “advanced technology” sources (the key here being the meaning of the second part of the equation). The latter apparently stands for technologies such as “clean coal”, carbon sequestration and nuclear (so the target for purely renewable energies comes out as a less ambitious goal than in the Illinois case, a mere 12.5%). You are currently browsing the Technology For Life weblog archives for September 2007.